"Nurse, we have a code red and white waiting for you in the E.R. ...get ready to be seduced!" Ah... the chills are running down the spine as those words are uttered! And these exquisite, seductive red and white leather cuffs and collar are exactly what the Doctor ordered for the Naughty Nurse! The leather is bridle leather which makes for premium luxury, fit and feel for restraints The wrist cuffs, ankle cuffs and their matching collar will give you a lifetime of use with unparalleled comfort and fit. 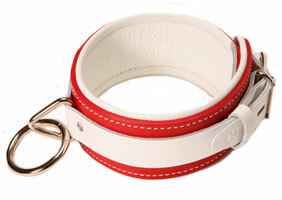 Fits wrist sizes from 5" up to 9.5"
Matching Naughty Nurse Ankle Cuffs... made by Sinvention with the finest quality English Bridle leather teamed up in white on red. Fits ankle sizes from 7" up to 12"
The final touch... reminding her of her passion, the collar is also made of the finest quality English Bridle leather teamed up in white on red. Fits neck sizes from 10" up to 16.5"